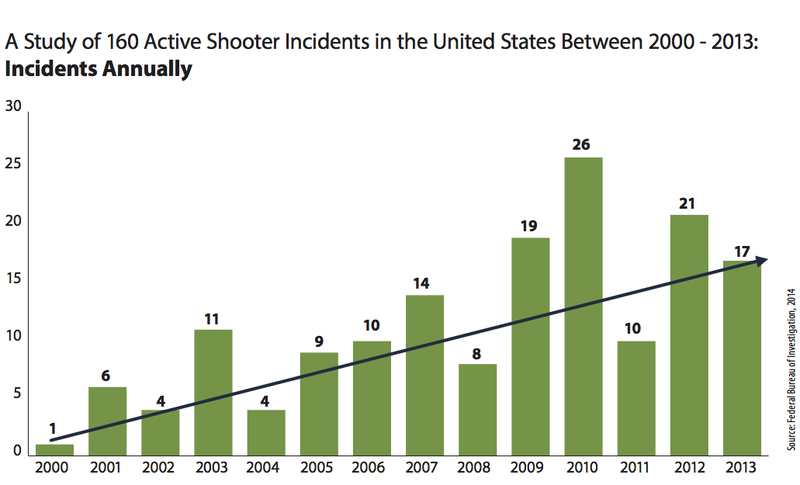 The FBI released a major study on September 24, 2014 entitled A Study of Active Shooter Incidents in the United States Between 2000 and 2013. The primary purpose of the FBI study is to provide law enforcement with data that will help them to better prepare and respond to Active Shooter Incidents (ASI’s), which will result in saving more lives and decrease the chance of copycat incidents. The FBI identified 160 ASI’s between 2000 and 2013, resulting in 486 people killed, excluding the shooters, and 557 others being wounded. One of the major findings was that ASI’s are becoming more frequent. The first seven years of the study show an average of 6.4 incidents annually, while the last seven years show 16.4 incidents annually. It was also noted that all but six shooters were male. Of the six female shooters, two of the ASI’s were in Institutes of Higher Education (IHE), and four were in businesses. The six female shooters accounted for 15 dead and 7 wounded. A third finding worth mentioning is that 90 (56.3%) of the ASI’s ended on the shooter’s initiative. That means they either committed suicide or fled the scene. Twenty-one ASI’s (13.1%) were ended by unarmed citizens restraining the shooter. The findings also reflect the damage from ASI’s that can occur in a matter of minutes. Even when law enforcement personnel were present or able to respond within minutes, civilians typically had to make life and death decisions without much time to react. This means that school staff must be engaged in training and discussions on the decisions that need to be made within the first moments of an ASI or any other crisis event. There were 64 incidents in which the duration of the incident could be determined. Forty-four (69.0%) of the 64 incidents ended in 5 minutes or less, while 23 ended in two minutes or less. The data in this study underpins the notion that campus safety professionals should provide all levels of employees with adequate training to help them make the necessary life or death decisions to respond to these events until law enforcement officerarrive (which in the best case scenario can take two to three minutes). Even with an ideal law enforcement response time, the decisions that will have the most impact on the outcome of the event are likely to take place within the first few seconds of the event. Our research shows that the best defense against an Active Shooter can be to identify the violent offender before they begin the actual attack phase. This approach has helped stop many attempted ASI’s outright and has reduced the loss of life in many other instances. An effective threat assessment using multi-disciplinary threat assessment teams is another evidence-based method in prevention measures. Finally, educating people on the warning signs of violence most often present before a violent act should be incorporated into every prevention program. The research shows that the old adage “An ounce of prevention equals a pound of cure” holds true when preparing for violence as well.It is equally important to teach people situational awareness skills that emphasize awareness of their environment. These skills can often help people avoid dangerous situations and will help them to assertively act on the input they gather fast enough for them to take protective action in time to make a difference in the outcome. In the event of an ASI, there are several measures that can be employed until the police arrive. Immediate steps should be taken to protect oneself, based upon the tactical considerations at the time of the incident. Once critical life preserving steps have been taken, it may be necessary to protect others, again based upon the tactical considerations at the time. There is considerable debate as to which training approach is most practical for this purpose, but there are many success stories that should be researched and considered. 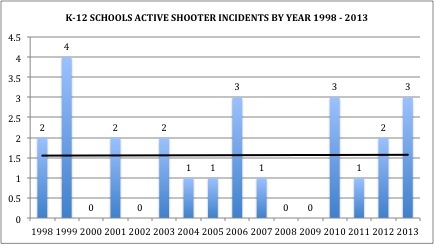 Of particular interest is the fact that this FBI study has changed the definition of an Active Shooter. In 2013 the Department of Homeland Security, the FBI, along with other federal agencies defined an Active Shooter as “an individual actively engaged in killing or attempting to kill people in a confined and populated area; in most cases, active shooters use firearms and there is no pattern or method to their selection of victims.” However, in the current study the FBI excluded the word ‘confined’, explaining that it could omit incidents that occurred outside a building. In addition, the FBI also dropped the randomness of victim selection from this study’s definition. This is why there is a noticeable increase in the number of active shooter events, injuries and deaths. In 2013, victim selection was an integral part of the Active Shooter definition. By removing victim selection, more incidents are listed as an Active Shooter Incident. This significantly affects the results, especially in light of finding that ASI figures are increasing by more than 250% compared to previous studies. The study indicates that while more ASI’s have occurred, no additional acts of violence actually took place. We feel this is a very important point. How the data is interpreted will affect the types of intervention and response that will be applied. It is important to understand that a change in how the federal government defines ASI’s, rather than interpreting the ASI data, will show a sudden increase in ASI’s themselves. What is unclear is whether the change in definition indicates a change throughout the federal system, or whether the change is specific to this study. From the recent FBI Study that shows ASI’s on the increase. Note that K-12 schools ASI’s have a neutral trend in the number of ASI’s per year. In fact, even though the FBI study finds that ASI’s are increasing overall, it does not show an increase in K-12 environments. Therefore, for K-12 school safety professionals, this highlights the accomplishments in preparedness efforts that have been made in the past 16 years. Schools have improved their threat assessment processes, hardened their facilities, and improved their responses to acts of violence, and it shows. While ASI’s appear to be on the rise in other settings, they seem to remain stable in the school environment during the same time period using the same metrics. Perhaps the practices being used in schools could be modified and used in businesses, houses of worship and hospitals to help lower the incidents of ASI’s in their facilities. These practices are best when they are researched, are proven to work, and can be replicated in any facility. The FBI study is a great start for campus safety professionals look deeper into the Active Shooter phenomena and its impact in our profession. A critical eye is necessary to consider the report and its implications well as the applications to our profession. This report underscores the need for more research and considerations of the long-term implications for any plan we implement. A good start for training for the increase in ASI’s is the free FEMA courses IS-360 Preparing for Mass Casualty Incidents: A Guide for Schools, Higher Education, and Houses of Worship2 and IS-907 Active Shooter: What You Can Do3. Of course, it is always helpful to start with a solid foundation in the other topics covered in the free training offered on the topics of emergency management, exercise design, National Incident Management System (NIMS), and other courses covering the groundwork for a solid emergency preparedness and response plan. Lastly, we want to point out that schools are still the safest place to be for children. As pointed out above, the actual rate of violent incidents has not changed, just their categorization. That means that school-related homicides still account for less than 1% of all juvenile homicides. As found in Relative Risks of Death in K-12 Schools, school transportation-related deaths are still the leading cause of fatalities in K-12 school environments.